I love working with the Patriot girls in our AHG Troop. I’m in no way biased when I say, we have the best group of girls around. 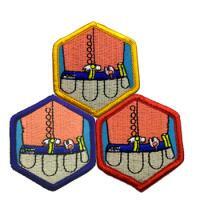 Recently they completed the Home Care and Repair Merit Badge. I tried to explain to them that the material covered in this badge would help them in life. Last week I came across a Facebook post in one of my homeschool groups that exemplifies this perfectly. I opted to share it with them and you. Requirement #20 of the Home Care and Repair Merit Badge has the girls learn the purpose of the sink trap and different ways to clear a clogged drain. During unit time we discussed some of the common methods of clearing a drain and the advantages and disadvantages of each. We also went into the church’s bathroom and located the P-trap and discussed how to clean it out. As you can tell the lady above never learned how to do just that. Yes, the names have been blacked out to protect the innocent. Cleaning out the P-trap is one of the most effective ways to clean a clogged drain. While it is not fun, it gets the job done. The American Heritage Girls Mission Statement is “Building women of integrity through service to God, family, community and country.” It seems that we also are building independent women. Just another reason why I love American Heritage Girls. 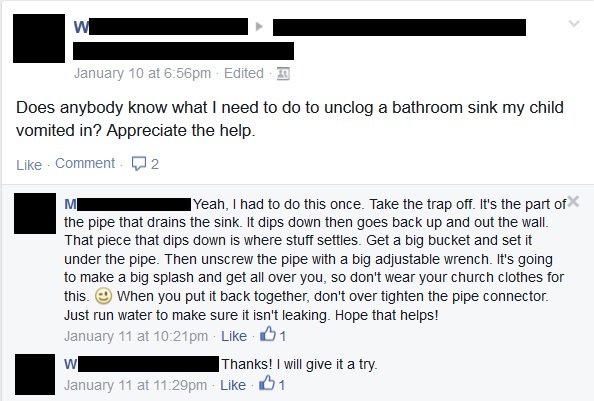 This entry was posted in American Heritage Girls and tagged AHG, Family Living Frontier, merit badge, plumbing. Bookmark the permalink.